Note: several of the issues referred to below have now been addressed are in process of being sorted. 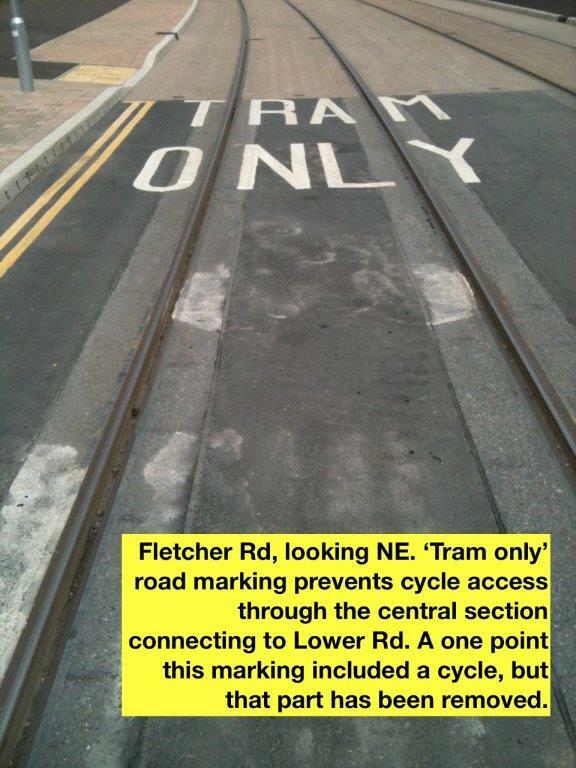 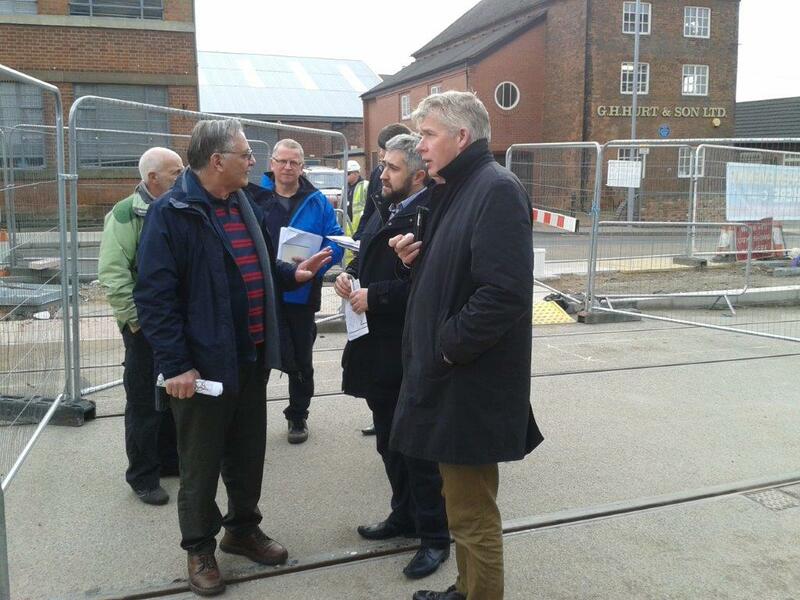 Notes of meeting held on 28 January 2016 to discuss these tram-related cycling issues. 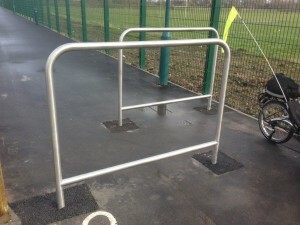 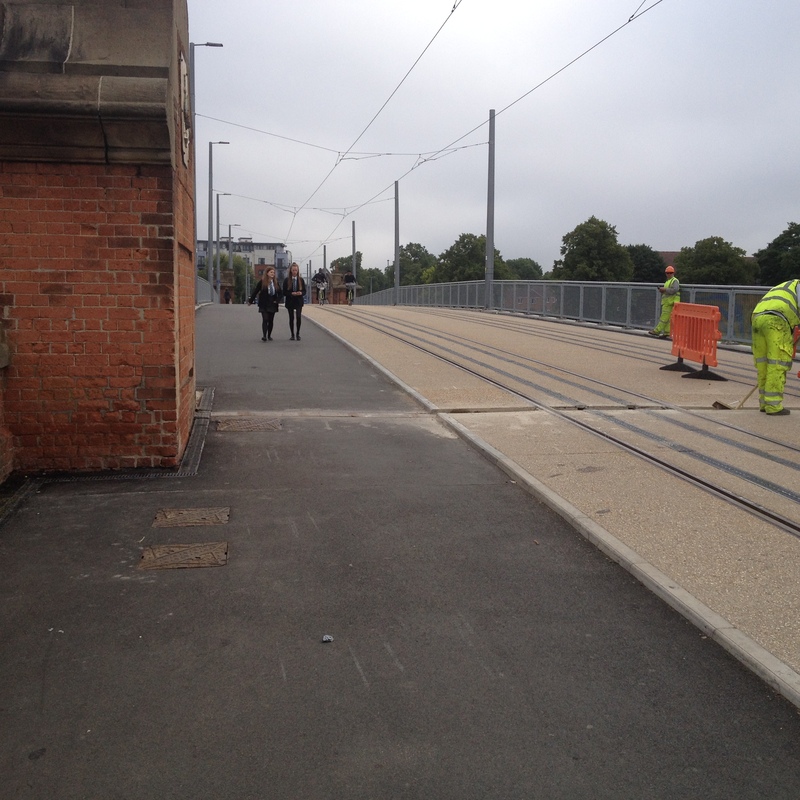 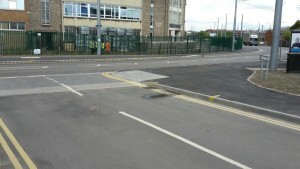 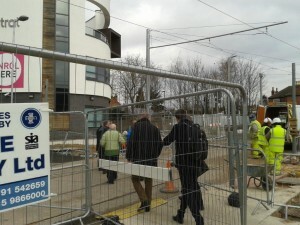 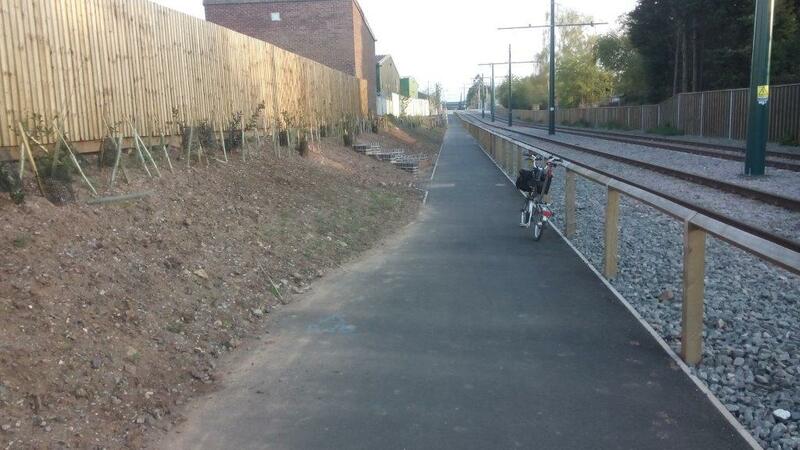 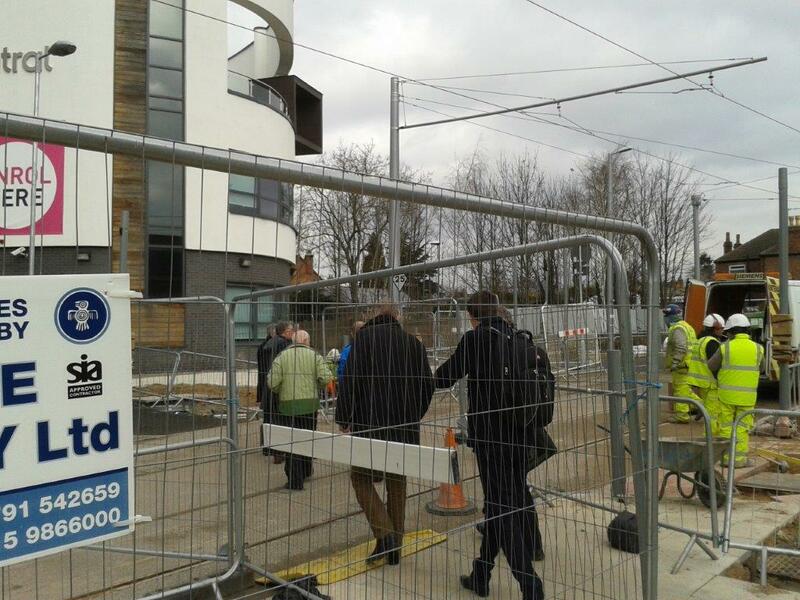 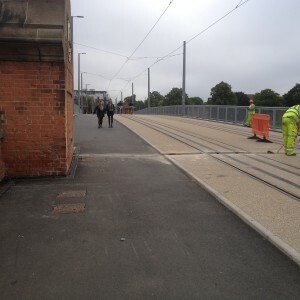 Even though both new tram lines were fully opened on 25 August 2015 Pedals continues our efforts to minimise risks for cyclists, and to help publicise good practice cycling safety advice and the various cycle facilities being introduced in conjunction with both new NET routes, to Clifton and Toton. 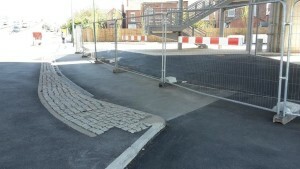 We are very keen to get further feedback from members on specific problems, whether they relate to hazardous features or just ones that are awkward or otherwise clearly substandard and the result of shoddy hastily completed and thoughtless construction detail. 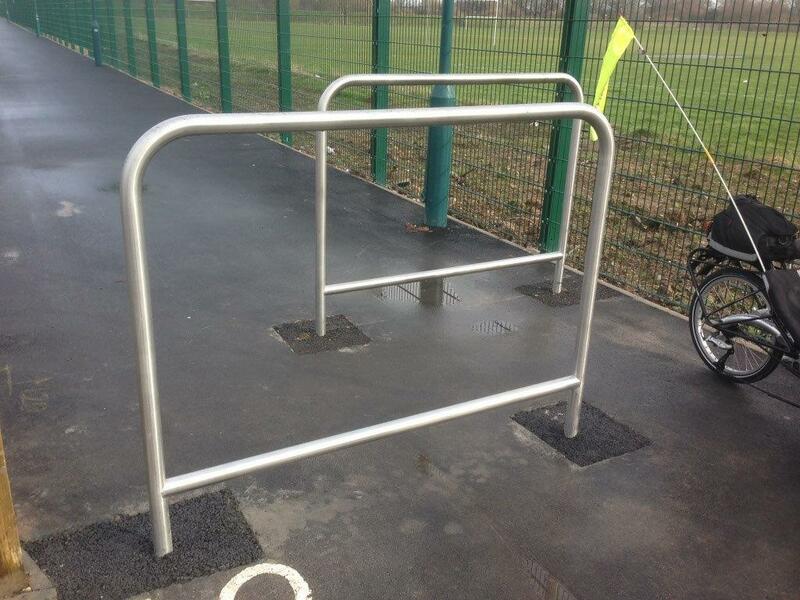 We want to know about these as well as ones that are mainly the result of various design constraints and which can perhaps be addressed only by improving signs and markings. 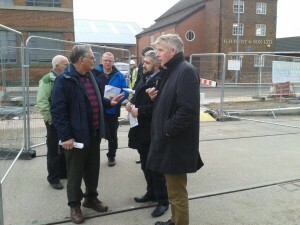 In February Peter Briggs and Hugh McClintock from Pedals, and Gary Smerdon-White and Martin Budjoso from Ridewise had extensive discussions with Tramlink and their contractors, TWA, about the series of issues reported in recent months by many cyclists. 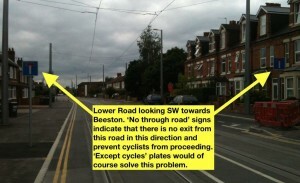 We went on to a site meeting to inspect the locations of many of these to help make quite clear what the particular issue was, as well as our more general concerns about the layouts in the Beeston and Chilwell areas, especially on the High Road and Chilwell Road. 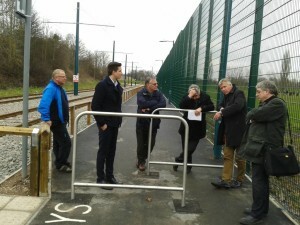 In this visit paid particular attention to what we consider to be the most hazardous parts of the new NET network; the very constrained section of route through Beeston and Chilwell High Road, but we also looked at some problem sites on the Clifton route near Wilford Toll Bridge and the new tramside paths past Wilford. 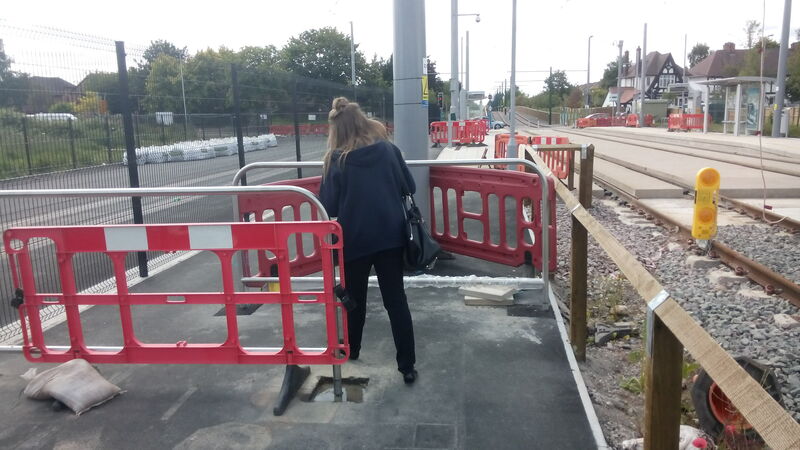 There was not time to visit all the problem sites but we have still made Tramlink and TWA aware of all of them and other problems that have been mentioned since. 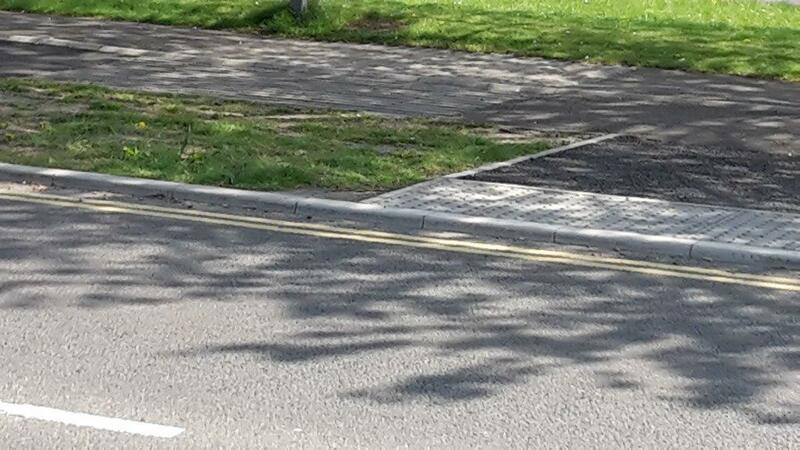 We plan another site meeting in the autumn of 2015 to assess progress in addressing these issues. 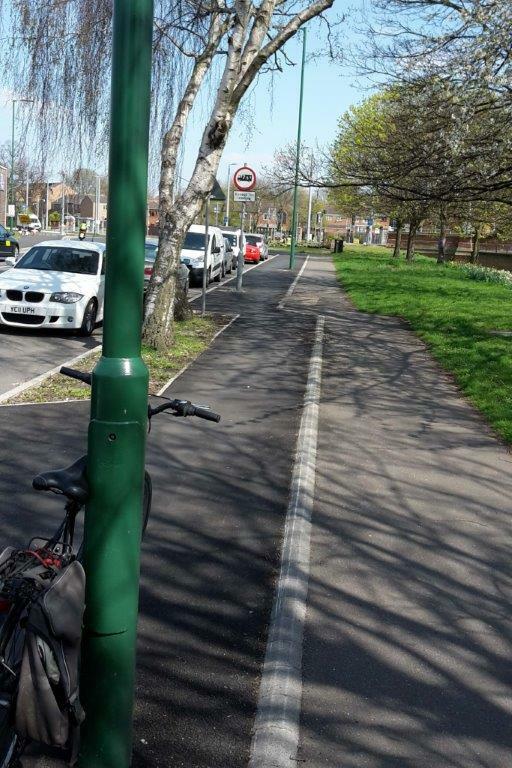 Please let us have feedback on the issues below including additional problems not included and also any cases where some modifications have now been made, e.g. 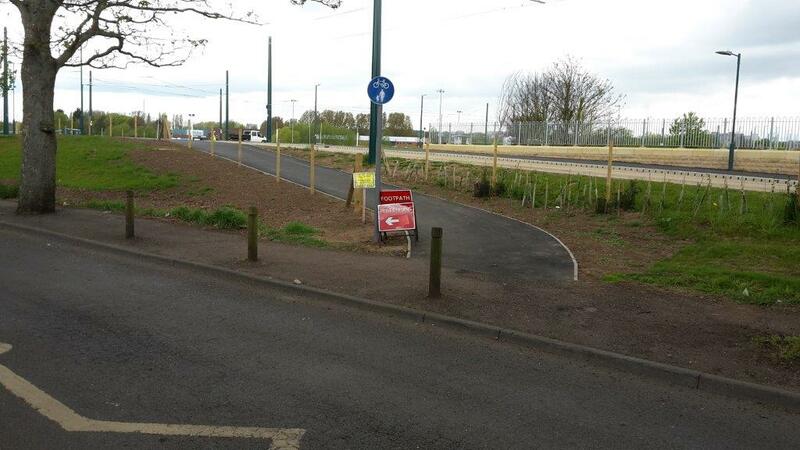 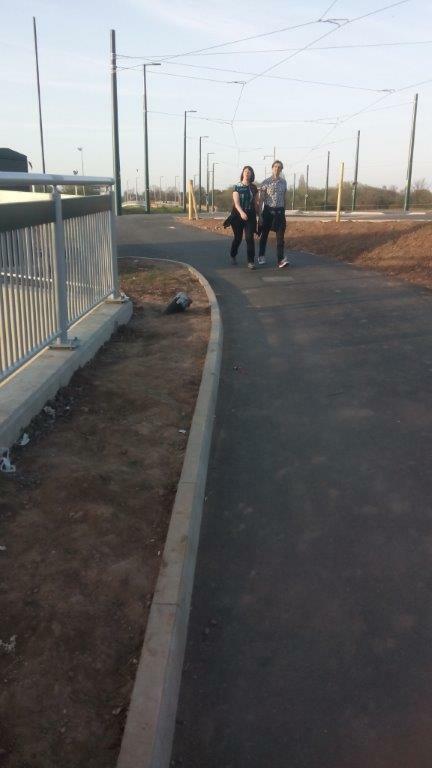 as happened in July 2015 to provide flusher kerbs at the crossing of Riverside Way north of the riverside path a bit west of the north end of Wilford Bridge. 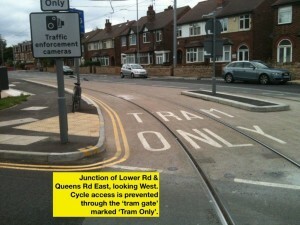 CT01: Hazardous layout by Central College with its shallow angle tram track crossing for east bound cyclists. 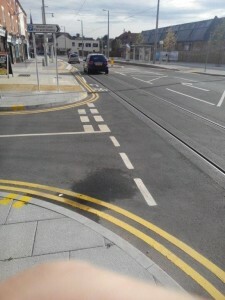 CT03: Clifton Boulevard end of Science Road (under the Ningbo tram bridge across the Ring Road towards the QMC): poor kerbing in the layout for cyclists going straight ahead on the Clifton Boulevard (west side) cycle path. 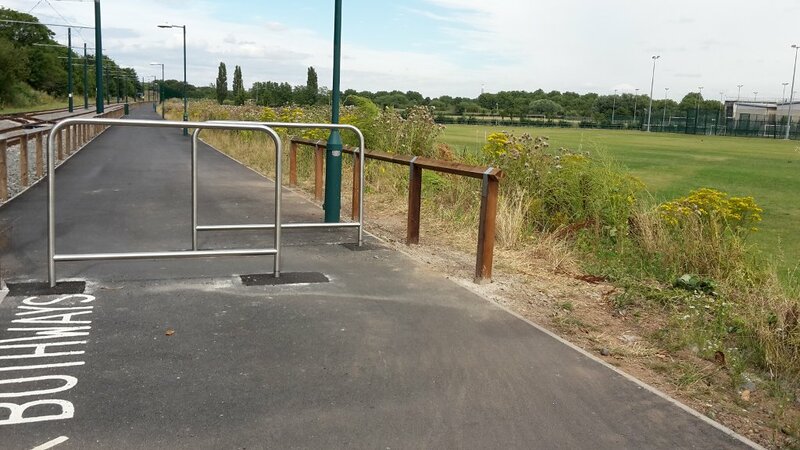 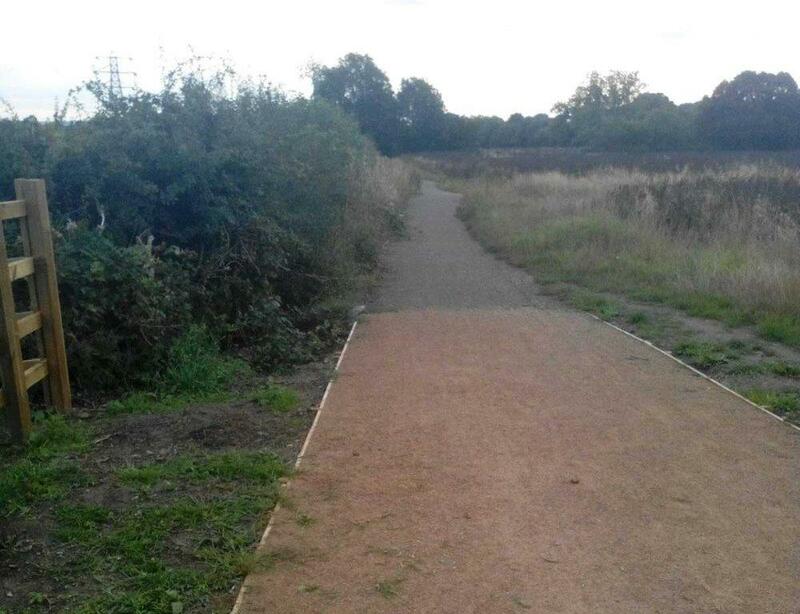 We are hoping that this will be sorted out by Highways England (former Highways Agency) and City Council as part of a series of improvements on this section of the Ring Road cycle paths. 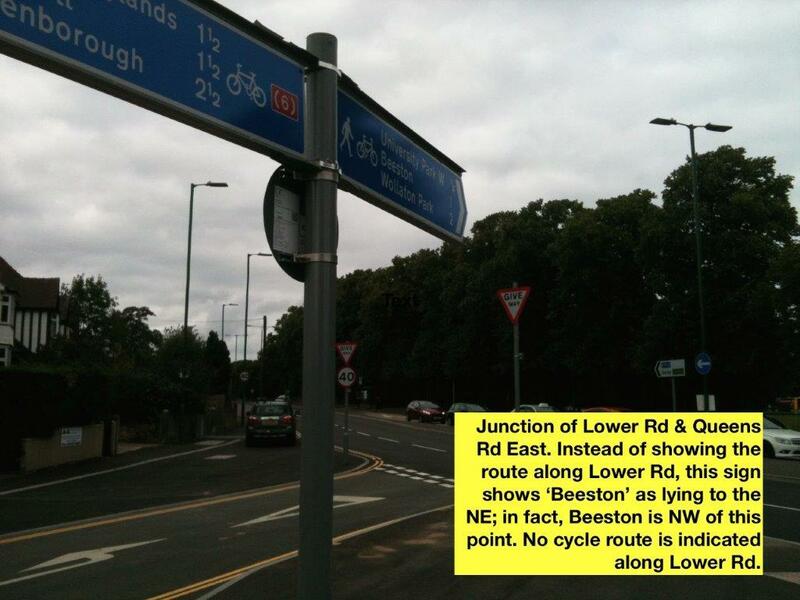 CT05; New Cycle route direction to City Centre via Castle Boulevard on Lenton Lane, on the path a little south of the tram stop, is not facing the right direction. 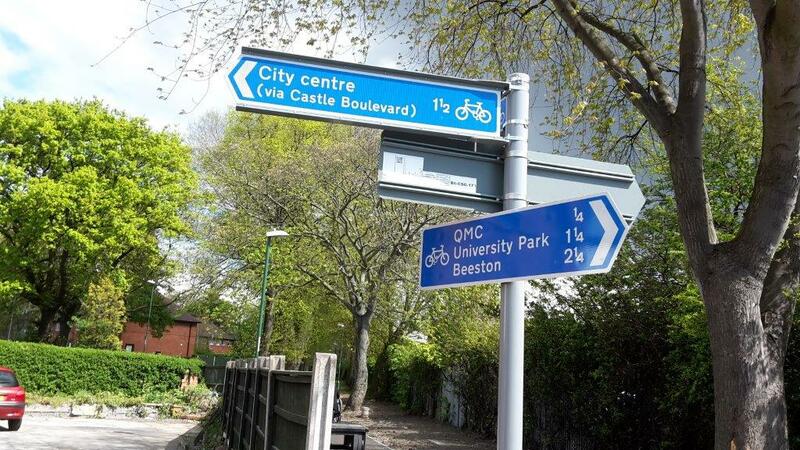 CT06: New Cycle route direction sign at the junction of the shared path on Abbey Street with the River Leen-side path heading N towards the QMC / Leengate and Wollaton etc. 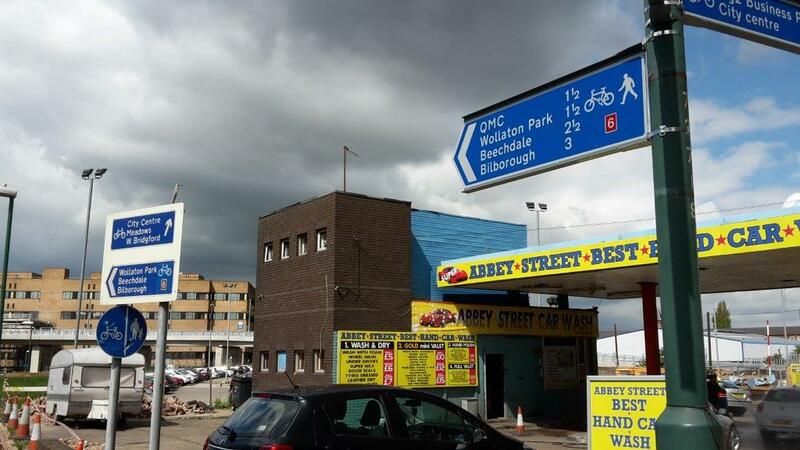 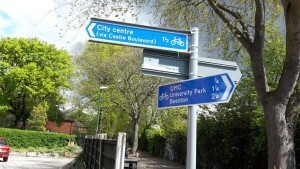 : the distance to the QMC is shown as 1 ½ miles which seems much greater than it actually is. 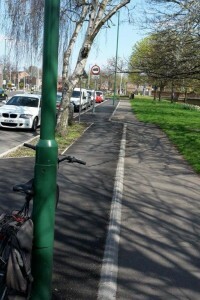 CT07: lack of flush kerbs at the Lower Road (Beeston) end of the cycle path connecting to Queens’ Rod East. CT08: lack of flush kerbs at the Queen’s Road East end of the cycle path connecting to Lower Road, Beeston. 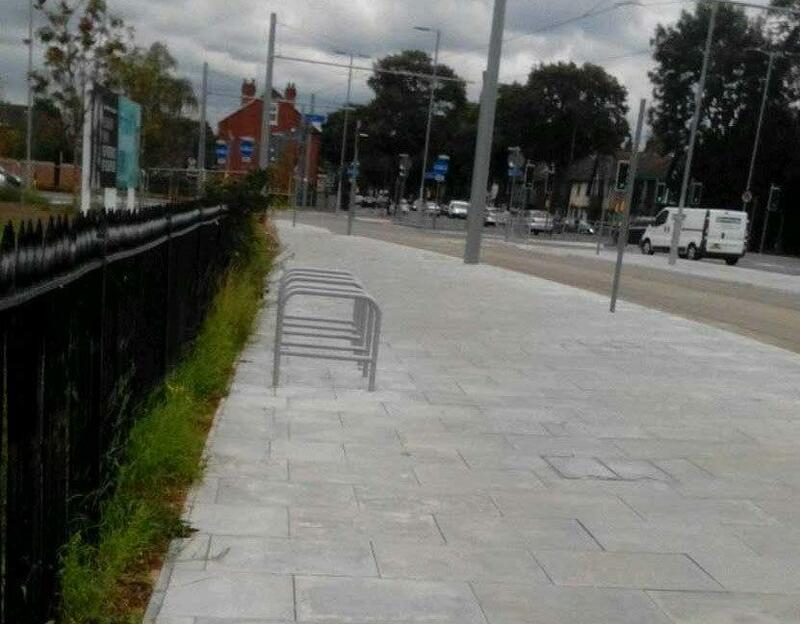 CT09: lack of flush kerbs on University Boulevard for cyclists from Queen’s Road East (and Lower Road) to access the University Boulevard north side cycle path. 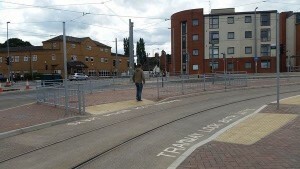 CT13: Middle Street and Station Street junction, Beeston: Take your life in your hands and cross the tracks at a super shallow angle – you can see the lane to aim for on the left. You’re taking the same path as this blue car. CT14: Middle Street and Station Street junction, Beeston: Make use of five stages to cross diagonally. 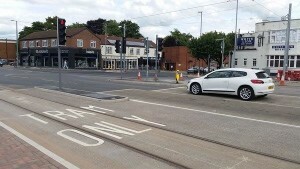 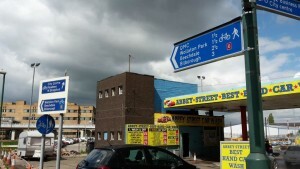 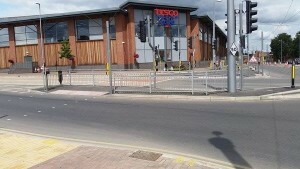 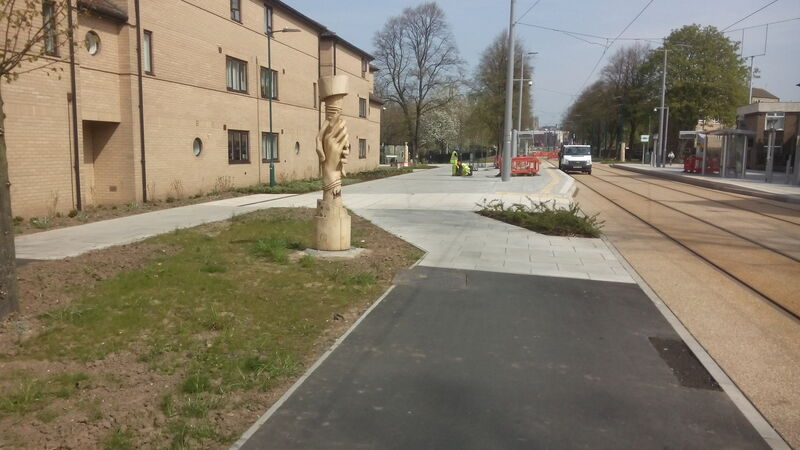 CT15: Middle Street and Station Street junction, Beeston: and two more to cross three arms. CT16: Middle Street and Station Street junction, Beeston: …which you have to do to go straight on (left to right) here because no crossing has been provided for you! 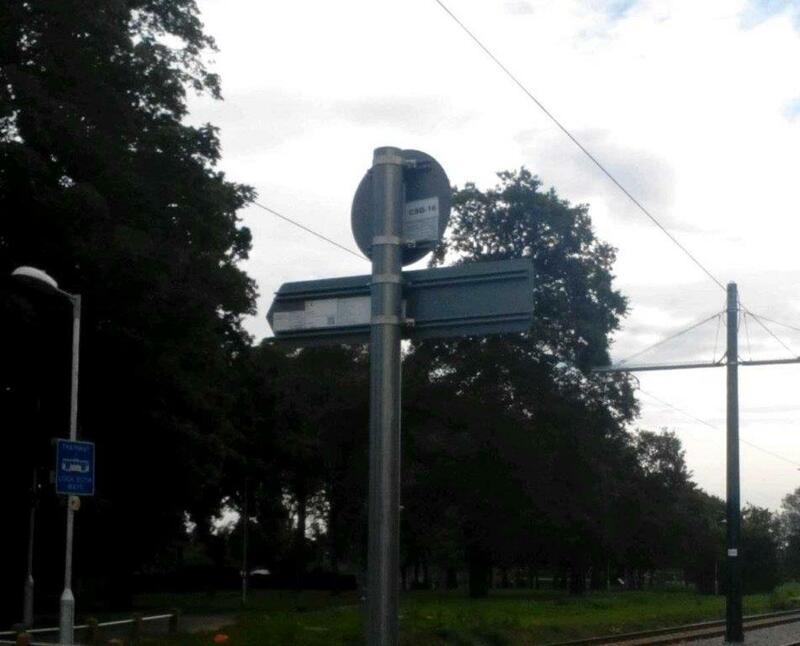 CT19: (Ben Troth, 9.9.15 with photos by David Lally on 14.9.15): poor visibility of signals at the University Park south entrance on the University Boulevard north tramside shared path when riding eastbound. 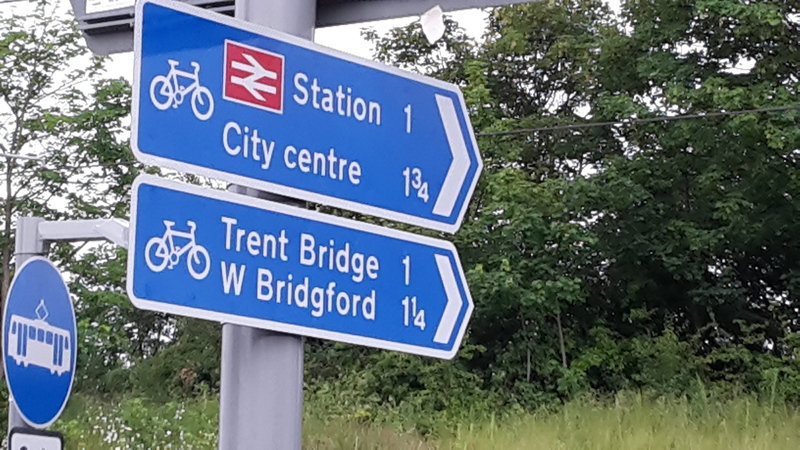 CT20: 1: (Gareth Gee, 16.9.15): While cycling AWAY from the University, south-westwards, one finds this, on Middle Street by The City, near City Road. 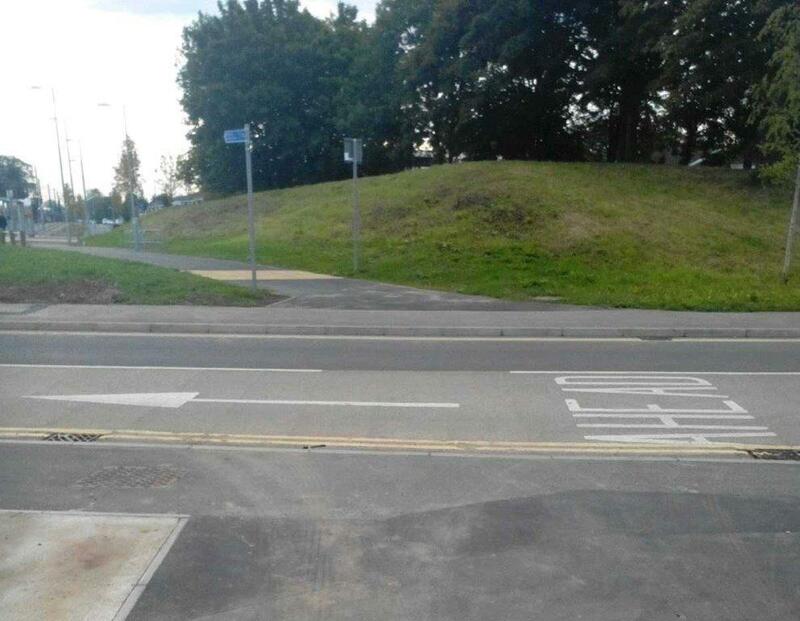 It seems to suggest that cyclists should mount the pavement here to get to these two places. 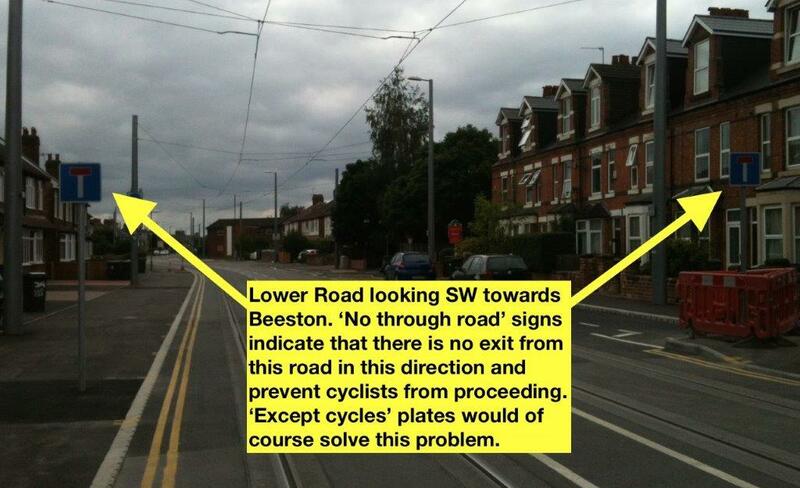 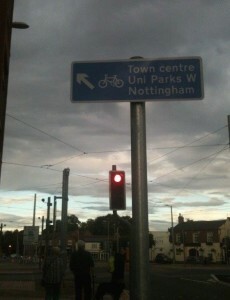 In fact, University Park would need a U-turn here, and Beeston town centre needs a right turn. 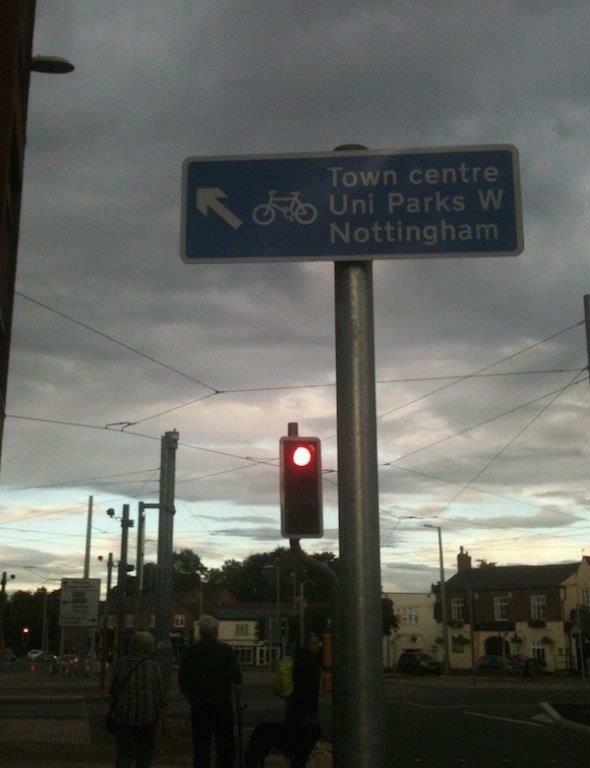 This sign is truly INSANE. 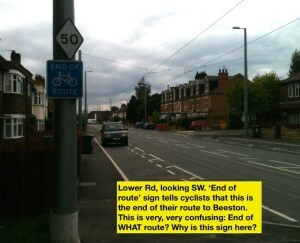 Just round the corner on City Road there is an even madder one, however, which states that ‘Town Centre’ is half a mile to the south-east – i.e., in exactly the wrong direction. 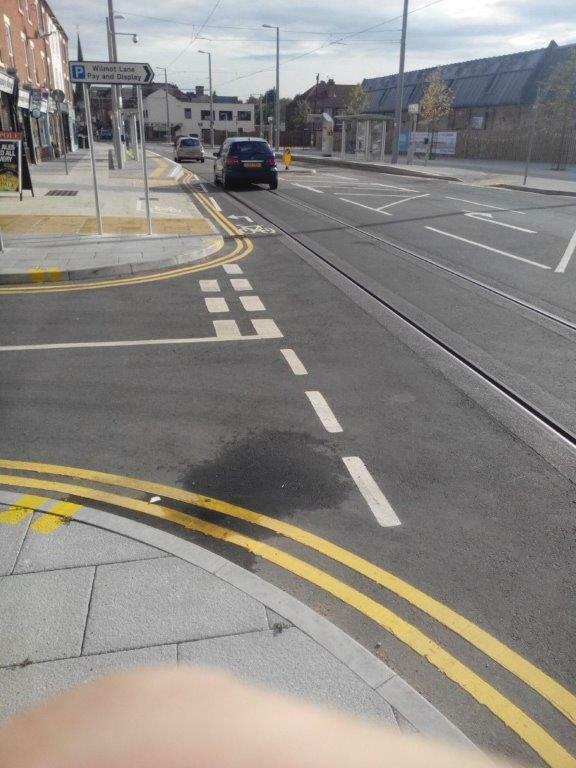 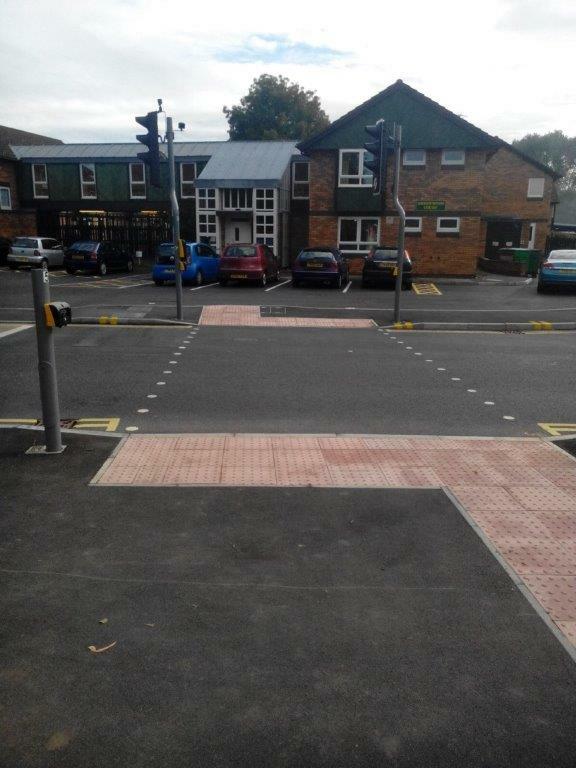 CT21: (Gareth Gee, 16.9.15): This one I call ‘Why the plural?’ It seems to direct cyclists either onto the tram tracks (just where that dangerous angle has been highlighted already), or perhaps straight through the front door of Tesco’s. It’s by the Scout centre on Middle Street, near the new Interchange. 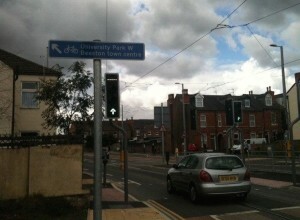 Here a left turn should be shown for ‘town centre’, the other two locations are straight. 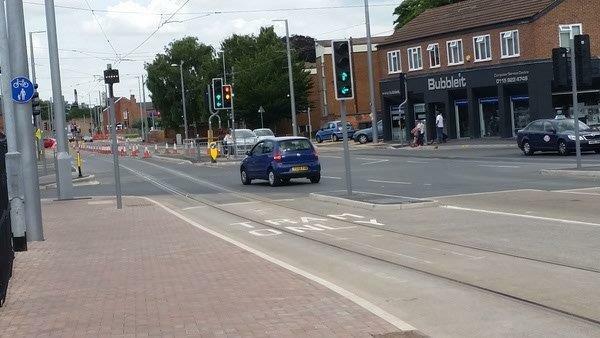 CT22: (Gareth Gee, 16.9.15): Middle Street/Station Road. 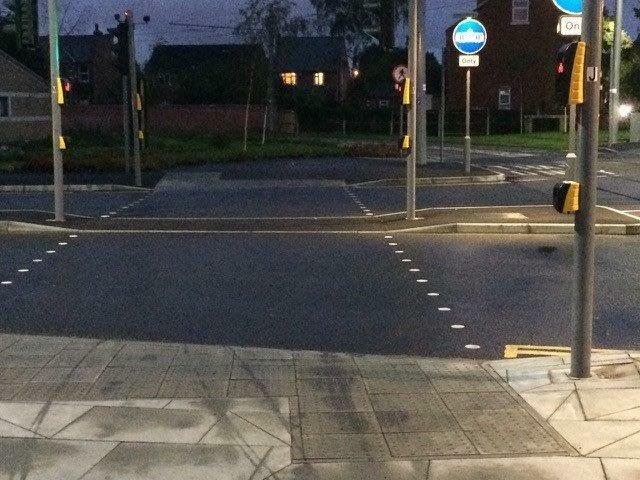 Is it an advanced stop line for right-turning cyclists, or not? 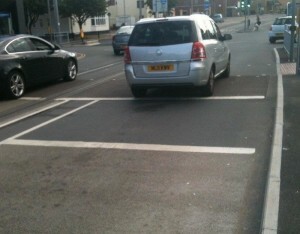 A parking space, maybe? Already causing arguments between motorists and cyclists, the confusion at this busy junction will likely lead to an accident. 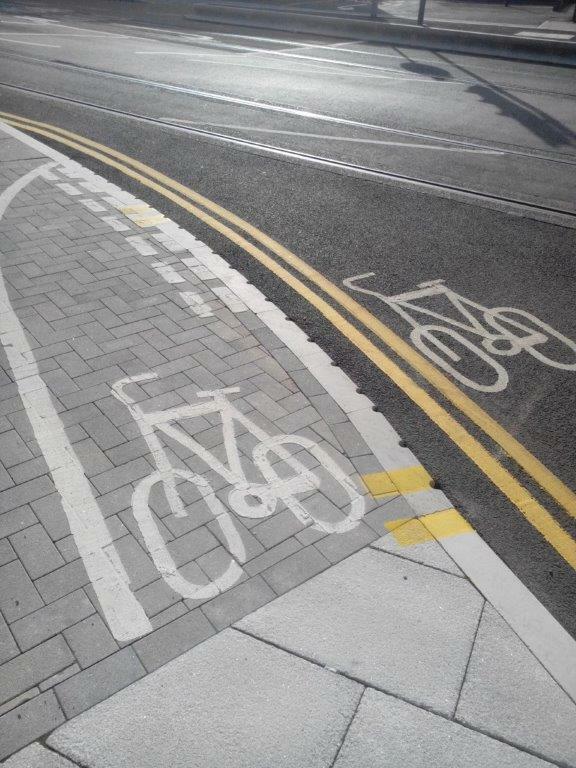 I don’t know whether there was supposed to be a cycle symbol painted in the box; maybe they just got fed up? 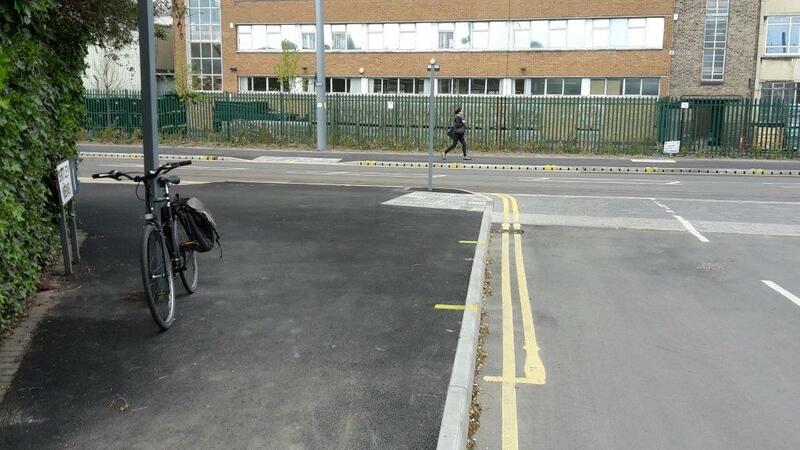 At the left of this photo, not shown, the stop line itself is missing across the cycle lane, suggesting that cyclists can just go straight through. 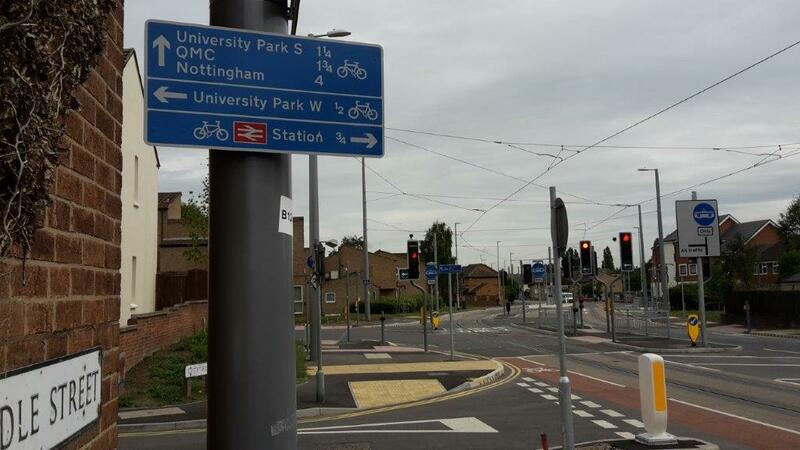 There is also a weird arrow directing cyclists up onto the narrow pavement at a blind junction – already mentioned a zillion times to NET, Nottingham Council, and Notts County Council, and consistently ignored. Thank you for the photo it clearly shows an error in the lining. 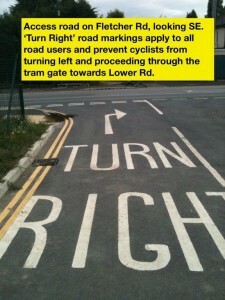 The line nearest to the crossing should not be there so that the right turn lane is set back from the other lane. 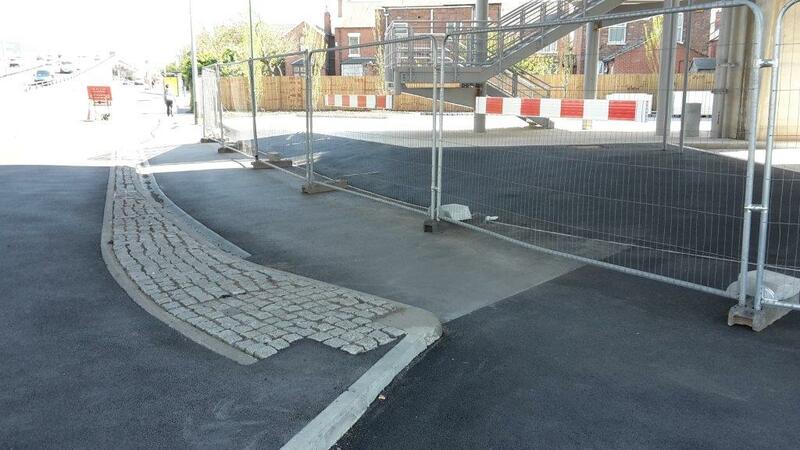 I will pass this information onto the NET Contractor so that it can be rectified. 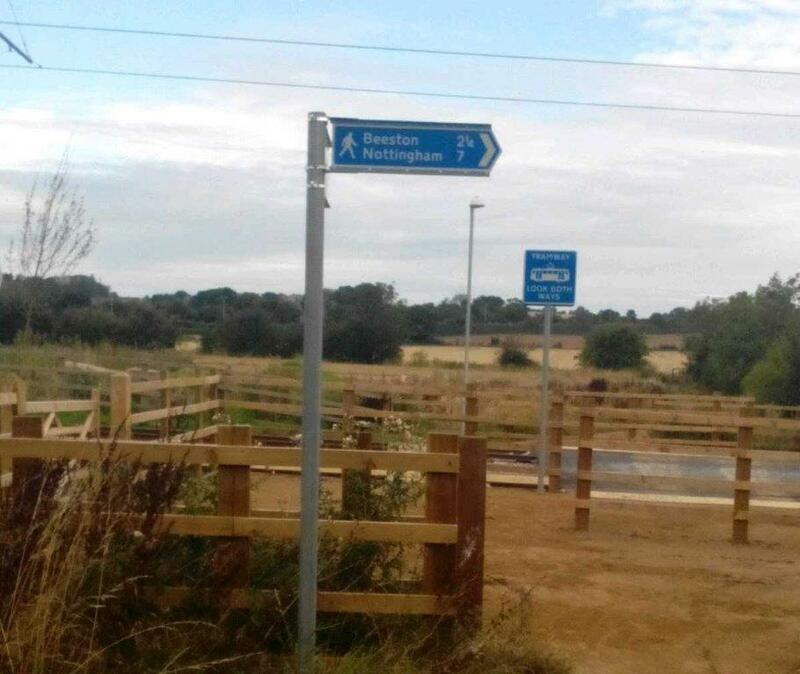 CT28: I am very confused here to notice a sign suggesting cyclists should dismount when using the path I have just cycled along, it is clearly the main cycle path to Beeston and there is no such sign when coming from the other end of the path??? 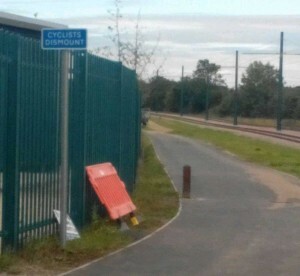 CT33. 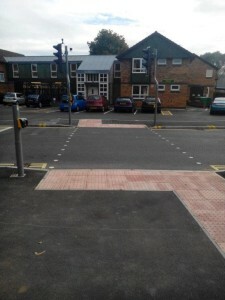 Experienced cyclists who intend to cycle straight down the road rather than use the footpath option around the junction here will turn right on to the road and will then come to a pedestrian crossing which if on red they will have no way of knowing as they joined the road between the light. 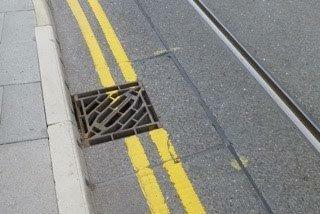 This could easily result in a serious incident. 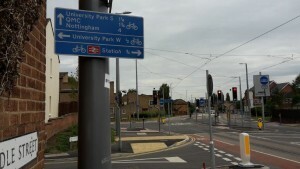 CT34: Central College – High Road. 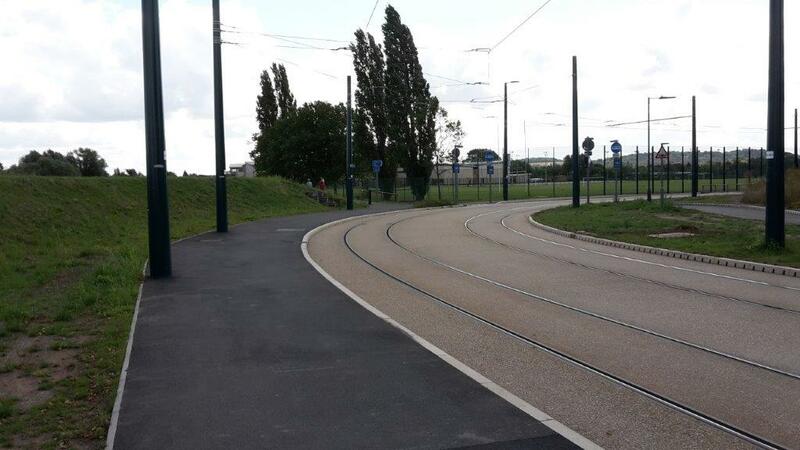 The route then down and along the High Road towards the tram tracks is not great for cyclists, especially with all the parked cars on the High Road. 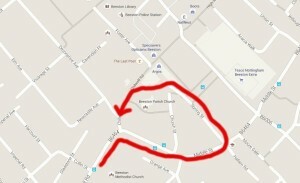 It is a shame no route through the back streets could have been found to keep off the High Road for as long as possible. 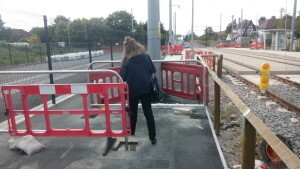 Then we come to what I think is the biggest problem with this route, this being where you are forced to cross the tram tracks (near the college). 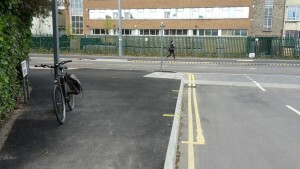 Whilst I understand there is the option to come off the road and follow the convoluted route sharing a path with all the students from the main doors of the college, experienced cyclists will want to stay on the road (which I understand should be suitable for all traffic to use, so this is not unreasonable). 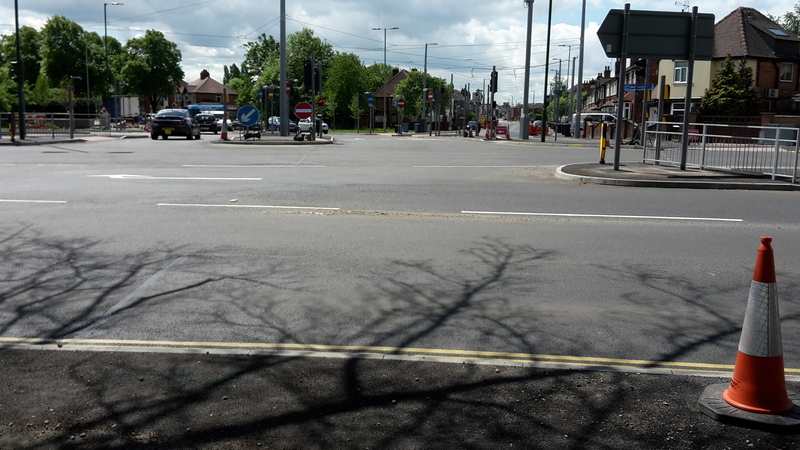 I have never managed to find any safe way to cross this junction as it invariably results in a near miss with the car behind as they get confused / impatient and try to pass just as you pull back along the road. This I find happens pretty much any time I attempt this junction with a vehicle behind me. 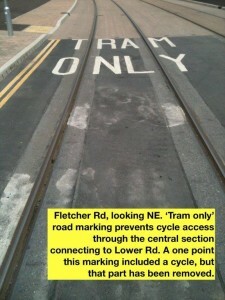 Cycling down the High Road if you stay between the two tracks works ok but can result in other vehicles getting impatient as they struggle to pass, there is also the problem that swerving to avoid any obstacle is not an option because of the tram track either side of you. 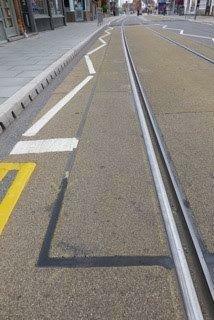 When you come to the end of the road and again have to cross the tracks I find exactly the same problem in that any attempt to follow the road to the right is very difficult and results in a near miss with the vehicle behind. 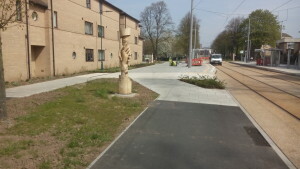 CL01: Crossing of Meadows Way. 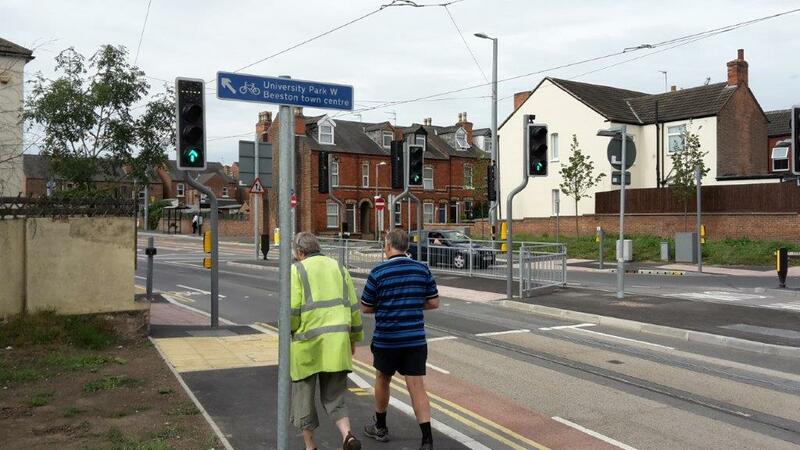 Crossing width is too narrow for shared use (cyclist and Pedestrian). 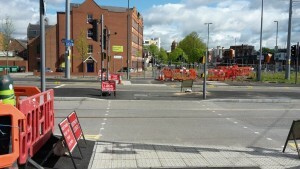 Long delays on signal change at crossing. 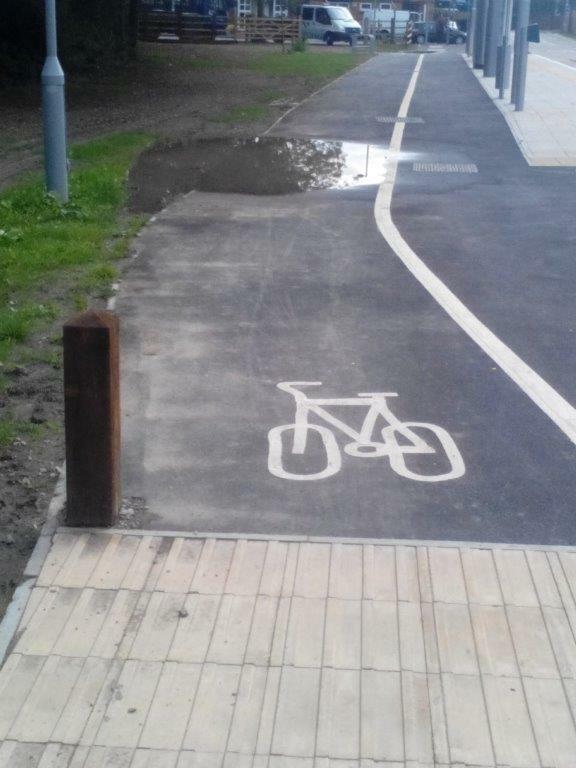 CL02: 100m (approx.) 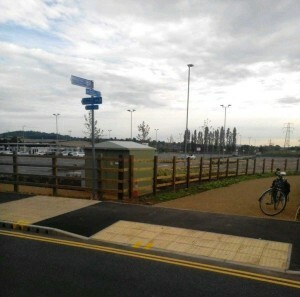 south of path junction with Meadows Way. 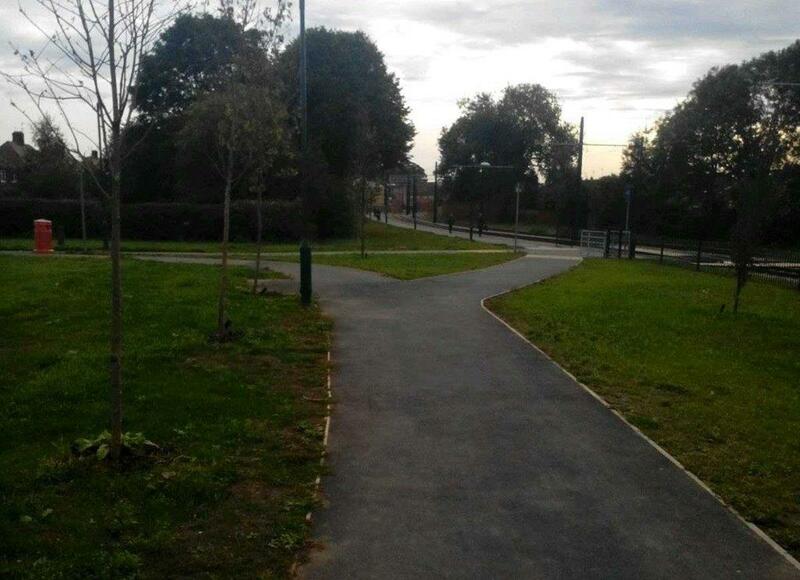 Path has a chicane that merges it with a parallel path, but merging is too narrow and chicane angle not acute enough – the result being numerous conflicts: Pedestrian-Cyclist and Cyclist-Cyclist. 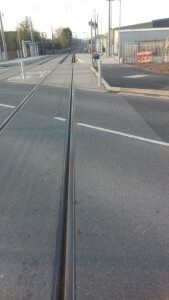 CL03: Queen’s Walk Tramstop. 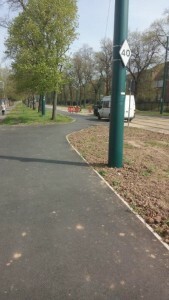 Chicane and narrowing of path: similar problem to chicane by Wilford Village tramstop. 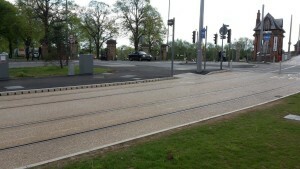 CL04: Meadows Embankment (N end of Wilford Toll Bridge) Tram Stop. 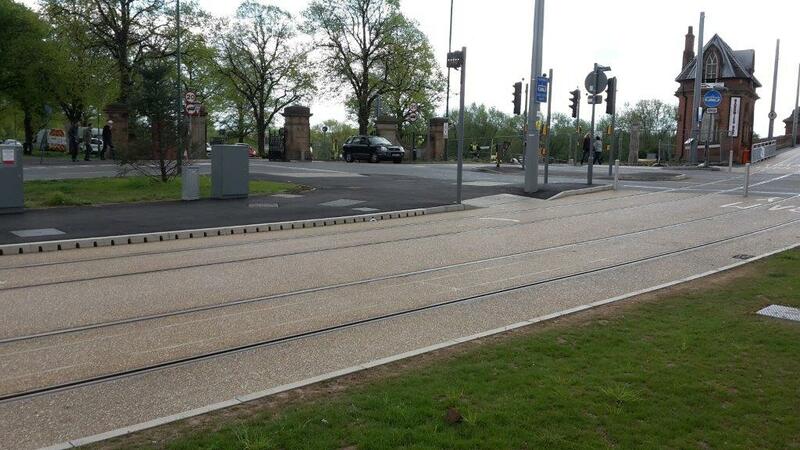 No provision for South bound Cyclists to turn left onto Victoria Embankment. 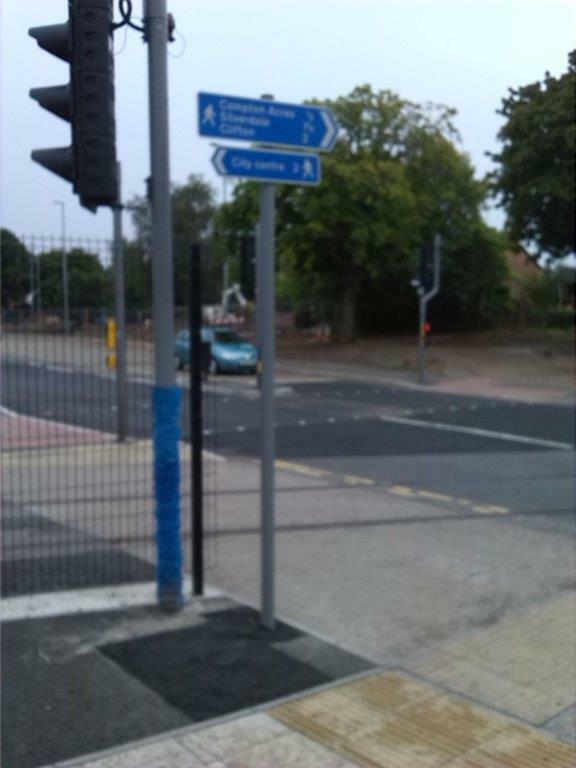 CL05: 3 lots of intruding poles in the realigned cycle path on Riverside Way just west of Wilford Toll Bridge (N end). 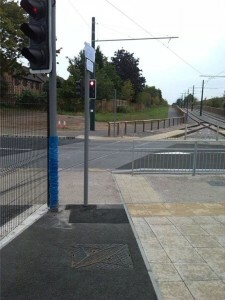 CL07: Meadows Embankment tramstop. 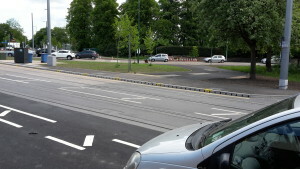 Chicane and narrowing of path adjacent to the tramstop (Northbound) is causing Cyclist-pedestrian and Cyclist-Cyclist conflict. CL08: Coronation Avenue, Wilford: no dropped kerb at the end of the shared path slope down from the tram route, on the north side of Coronation Avenue about half way between The Ferry PH and the corner where the tram turns towards Wilford Lane. 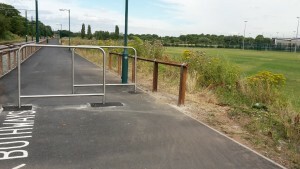 CL09: 3 sets of barriers on the tramside path east of Wilford, between the riverside (Coronation Avenue, Wilford) and Wilford Lane, with extra fencing added in August 2015 to deter bypassing of the barriers (CL9a). 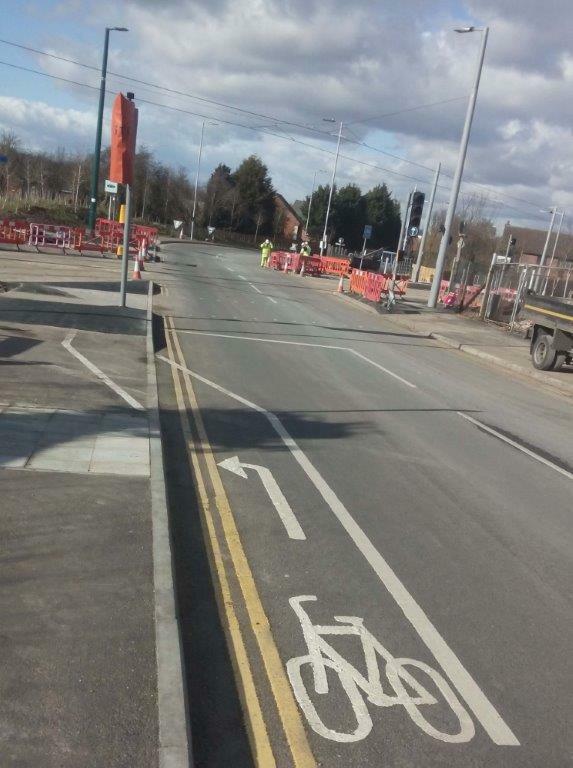 CL10: poorly thought out markings facing northbound cyclists on Ruddington Lane near the tram stop by the Industrial Estate which apparently direct you straight towards a lighting column! 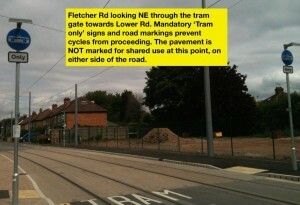 CL11: Ruddington Lane Tramstop. Hazardous access from Ruddington Lane (Ruddington direction) north to Tramside path towards Wilford Lane and vice-versa. 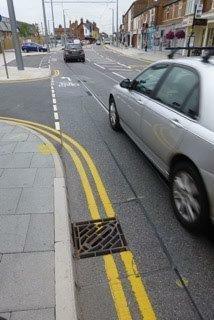 The very narrow access gap and close proximity of tramlines causes a hazard to Cyclists. 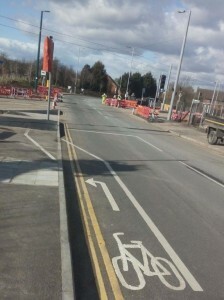 Also, Motorists need to be aware that Cyclists may turn right here. 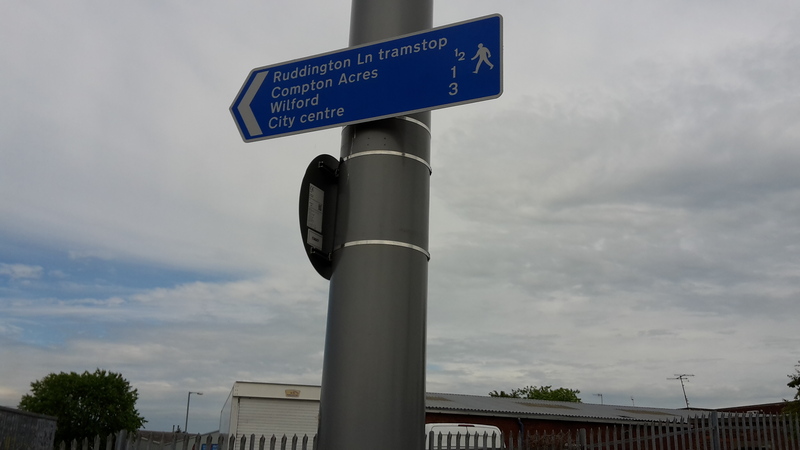 CL12: Wilford Ind Est/Ruddington Lane Tramstop. 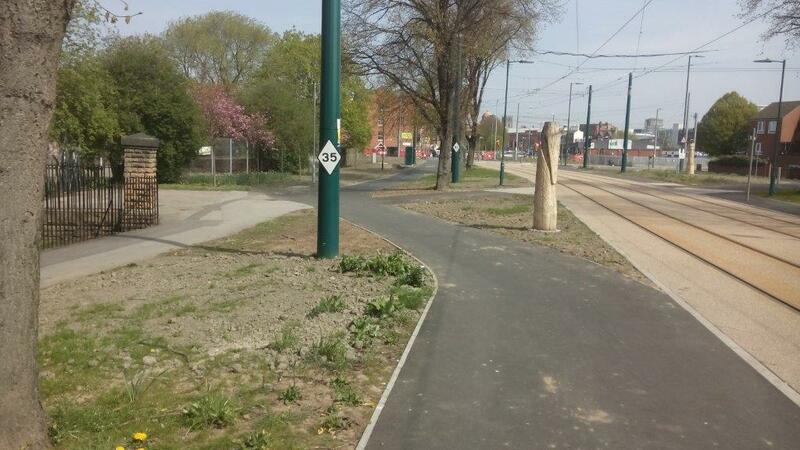 Dangerous narrowing of the path approx. 300m north of the tramstop: causing conflict between cyclists and pedestrians. CL13: Path section parallel to Ferry Inn Car Park, Wilford. 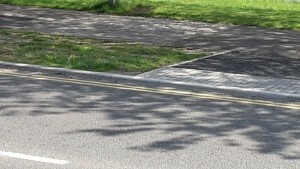 Dangerously positioned (and unnecessary) flowerbed chicane on the downslope of the path. This feature puts cyclists in direct conflict with pedestrians as it forces a confusing position change on both: especially risky for unfit pedestrians (struggling with the gradient) as they appear to be confused by the Cyclists behaviour (necessitated by the poor positioning of the chicane). 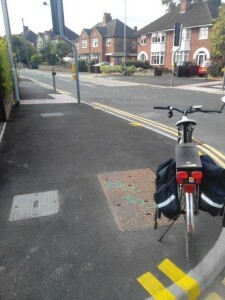 CL14: Path crossing of B679 Wilford Lane, nr Becket School. Badly positioned Traffic light poles giving a narrow gap with insufficient clearances is causing a hazard to Cyclists needing to cross and conflict with pedestrians. Very long delay on crossing signal changes (30-40 seconds) is both hazardous and prejudicial to NMUs. Solutions: Site assessment and functionality study involving substantial consultation with Cyclists and other NMUs, repositioning/redesign of Crossing. CL15: Narrowing of path 200m (approx.) 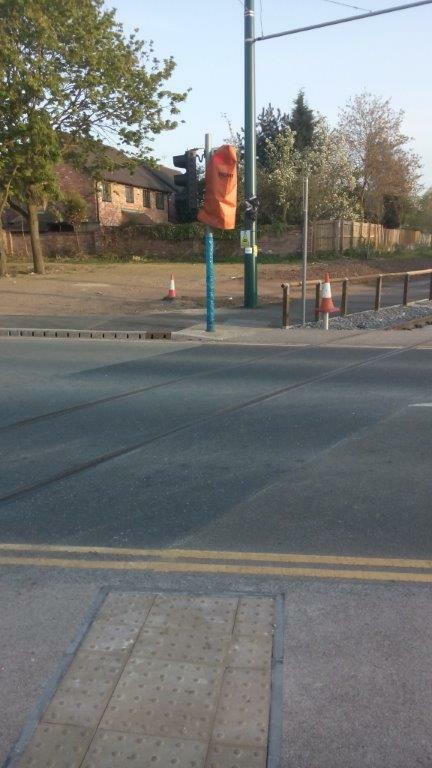 south of Wilford Ind Est/Ruddington Lane tramstop. Path narrows on approach to A52 underpass, getting even narrower under bridge. Lack of space is causing conflict between cyclists and pedestrians, producing a hazard. CL16. 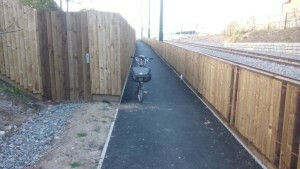 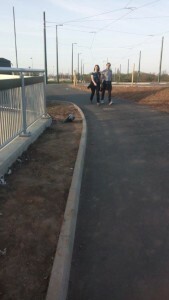 Shared path on Wilford Toll Bridge is very hard for cyclists to ride over during peak periods as it is dominated by children walking to and from school. 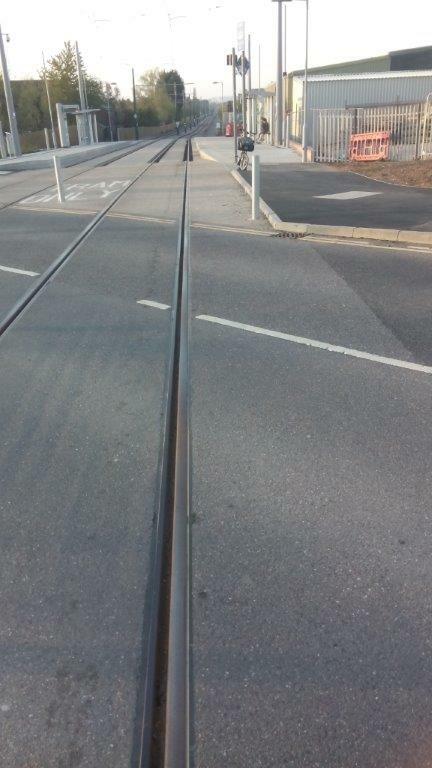 Cyclists therefore often ride close to the tram tracks. CL17. 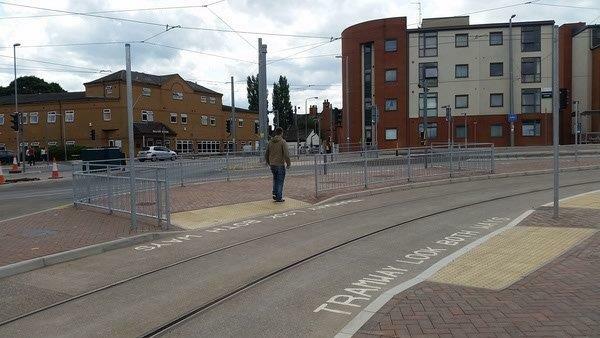 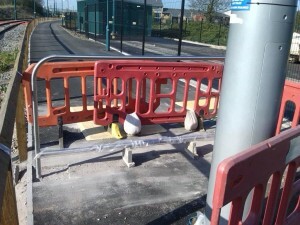 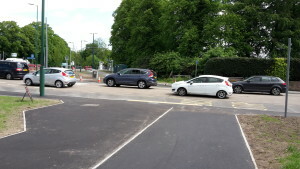 New barriers erected on 15 June 2015 just north of the Wilford Lane tramstop. CL18. 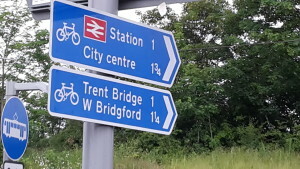 Cycle route direction sign to ‘Trent Bridge’ and ‘West Bridgford pointing the wrong way at the Coronation Avenue (Wilford) end of the riverside path to and from the Suspension Bridge. 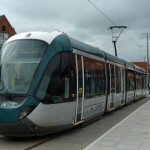 CL19. 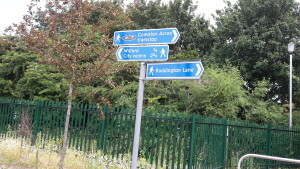 Directions signs on east side of tramside path between Ruddington Lane and Compton Acres show only pedestrian symbol and not also cycle symbol. 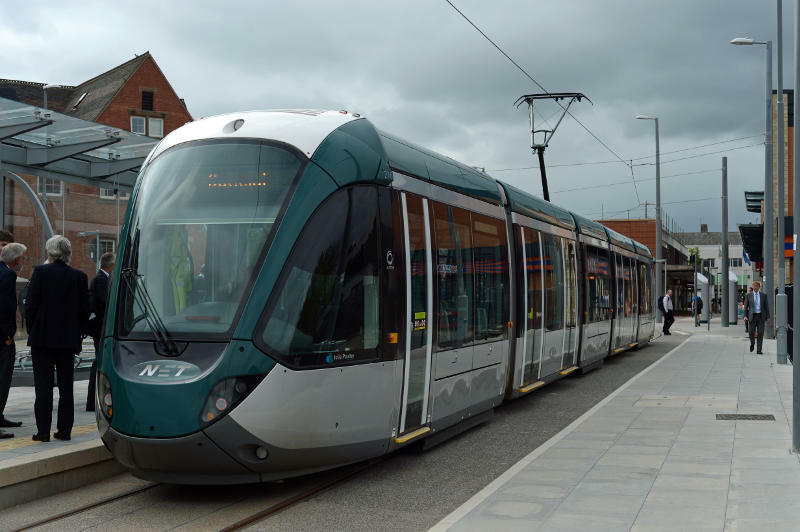 CL20. Poor intervisibility, because of the mound on the north side of the path junction at the east end of Coronation Avenue, Wilford (by the bend in the tram tracks), between eastbound path users on the tramside cycle path just north of Coronation Avenue and westbound path users on the riverside path approaching the path junction, and the tram track crossing to and from Coronation Avenue. CL21.Badly positioned new sign posts by Wilford Lane, just south of the Wilford Lane tram stop, erected in late August 2015, and reducing the effective width of the path. 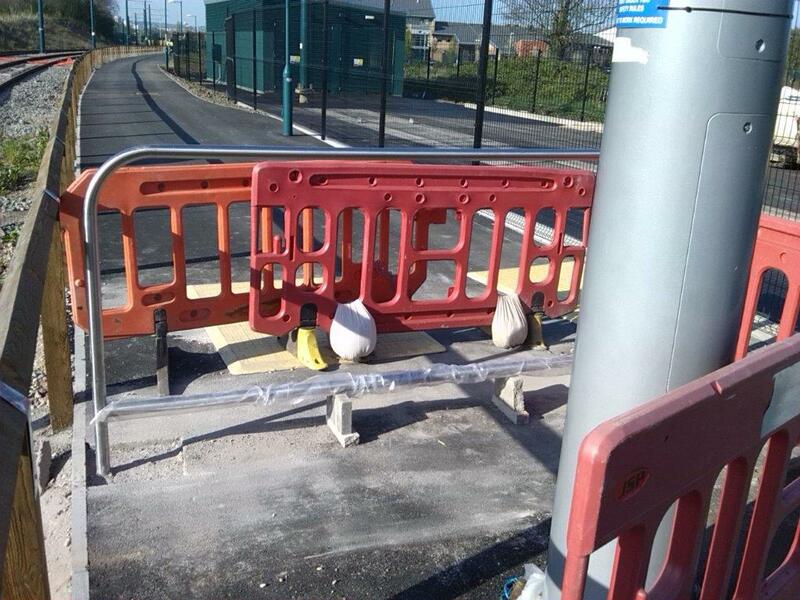 We understand that the contractors have a period of one year from final completion (25 August 2015) to deal with snags on both routes so we recognise that we may well have to wait a long time yet to get many of these detailed issues properly sorted out! 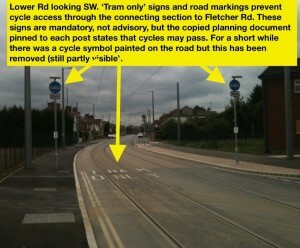 We intend to keep up the pressure and would welcome support from other people to help do this please!